Aljamiado text by Mancebo de Arévalo. c. 16th century. Aljamiado (Spanish: [alxaˈmjaðo]; Portuguese: [aɫʒɐmiˈaðu]; Arabic: عَجَمِيَة‎ trans. ʿajamiyah [ʕaʒaˈmij.ja]) or Aljamía texts are manuscripts that use the Arabic script for transcribing European languages, especially Romance languages such as Mozarabic, Portuguese, Spanish or Ladino, and Bosnian with its Arebica script. According to Anwar G. Chejne, Aljamiado or Aljamía is "a corruption of the Arabic word ʿajamiyah (in this case it means foreign language) and, generally, the Arabic expression ʿajam and its derivative ʿajamiyah are applicable to peoples whose ancestry is not of Arabian origin". In linguistic terms, the Aljamía is the use of the Arabic alphabet to transcribe a Romance language. It was used by some people in some areas of Al-Andalus as an everyday communication vehicle, while Arabic was reserved as the language of science, high culture, and religion. The systematic writing of Romance-language texts in Arabic scripts appears to have begun in the fifteenth century, and the overwhelming majority of such texts that can be dated belong to the sixteenth century. A key aljamiado text was the mufti of Segovia's compilation Suma de los principales mandamientos y devediamentos de nuestra santa ley y sunna, of 1462. In later times, Moriscos were banned from using Arabic as a religious language, and wrote in Spanish on Islamic subjects. Examples are the Coplas del alhichante de Puey Monzón, narrating a Hajj, or the Poema de Yuçuf on the Biblical Joseph (written in Aragonese). Aljamiado played a very important role in preserving Islam and the Arabic language in the life of the Moriscos. After the fall of the last Muslim kingdom on the Iberian peninsula, the Moriscos (Andalusian Muslims in Granada and other parts of what was once Al-Andalus) were forced to convert to Christianity or leave the peninsula. They were forced to adopt Christian customs and traditions and to attend church services on Sundays. Nevertheless, some of the Moriscos kept their Islamic belief and traditions secretly through the usage of Aljamiado. In 1567, Philip II of Spain issued a royal decree in Spain, which forced Moriscos to abandon using Arabic on all occasions, formal and informal, speaking and writing. Using Arabic in any sense of the word would be regarded as a crime. They were given three years to learn the language of the Christian Spanish, after which they would have to get rid of all Arabic written material. 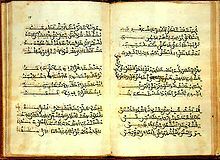 Moriscos translated all prayers and the sayings of their prophet Mohammed into Aljamiado transcriptions of the Spanish language, while keeping all Qur'anic verses in the original Arabic. Aljamiado scrolls were circulated amongst the Moriscos. Historians came to know about Aljamiado literature only in the early nineteenth century. Some of the Aljamiado scrolls are kept in the Spanish National Library in Madrid. The word aljamiado is sometimes used for other non-Semitic language written in Arabic letters. For example, Bosnian and Albanian texts written in Arabic script during the Ottoman period have been referred to as aljamiado. However, many linguists prefer to limit the term to Romance languages, instead using arebica to refer to the use of Arabic script for Slavic languages. 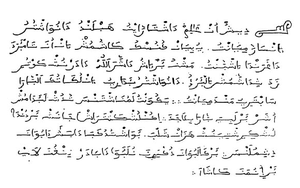 The word Aljamiado is also used to refer to Greek written in the Arabic/Ottoman alphabet. ^ The passage is an invitation directed to the Spanish Moriscos or Crypto-Muslims so that they continue fulfilling the Islamic prescriptions in spite of the legal prohibitions and so that they disguise and they are protected showing public adhesion the Christian faith. ^ L.P. Harvey. "The Moriscos and the Hajj" Bulletin of the British Society for Middle Eastern Studies, 14.1 (1987:11-24) p. 15. ^ Gerard Albert Wiegers, Islamic Literature in Spanish and Aljamiado 1994, p. 226. Alhadith: Morisco Literature & Culture A website devoted to the literature and language of the Moriscos; contains a multilingual bibliography, digital texts, and a catalogue of aljamiado-morisco manuscripts.